This week I believe I had a breakthrough in the direction that I want to take the concept, and based on that I did a lot of reaching out to people, crowd sourcing and planning. Deb suggested looking at categories/genres and group female comedians by those (writers, stand-up, sitcom/comedic actress). We talked about Mae West, MTM, Sarah Silverman, Ellen, Roseanne (“Domestic Goddess”) and Margaret Cho. Eric suggests the idea of focusing on one comedian as an interactive hologram. This could certainly help pull the project into focus. I met with Marianne this week and she gave me invaluable direction to take the project. 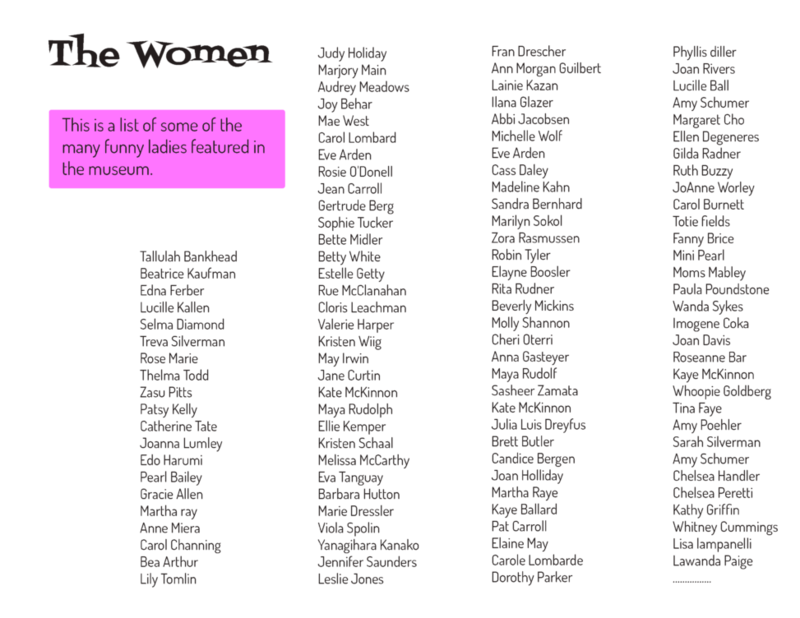 Including to think of this as a living history, and that women in comedy cannot be separated from the women’s movement, they go together in many ways. To Do: Find out who is relevant and put that into context. We discussed the possibility of pepper’s ghosting artifacts instead of having actual physical ones. Users can interface with them in that way. I have to figure out if I am going to portray individuals or moments in time. The idea that this could be packaged up as a kit and used to educate at schools came up. Although this is a nice idea, I prefer the long-term goal of this in the bigger picture, to be a stand-alone experience that once would have to go to to visit. To Do: Decide on if the content will be based on people or based on moments in time. I am continuing to read the book Wonderland by Steven Johnson. I have a pile of books to read at this point and hope to start getting through them. I need to focus my content first and then I can branch out into the specifics. Should I need to use parametric sound in the exhibit this technology could be good. For haptic, this can be used for starting out prototyping. 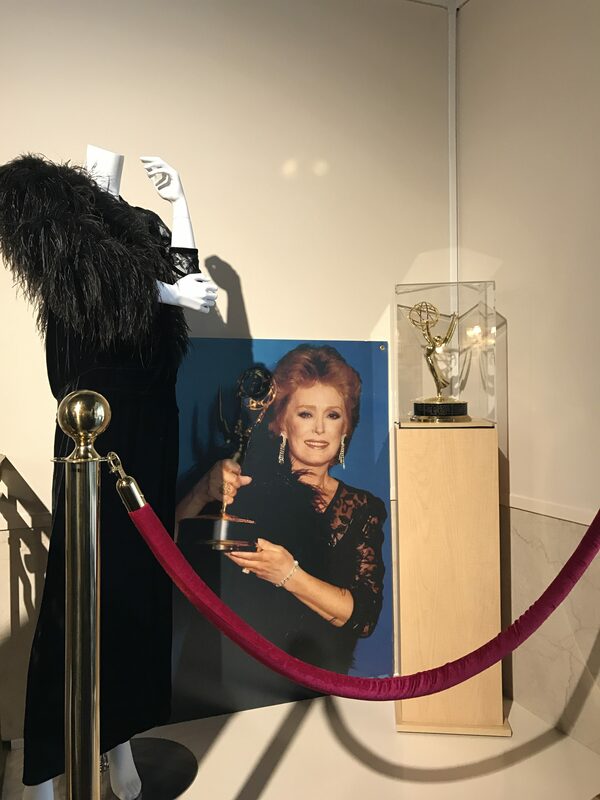 I was able to come across this Mary Tyler Moore Show script written by Treva Silverman. Whether or not I can use it legally is another question. Actually getting rights to use artifacts, footage, material and clips is a huge concern for this project and makes me second guess the feasibility of doing something like this. The responses were all over the place and not necessarily the stories that I wanted to tell. 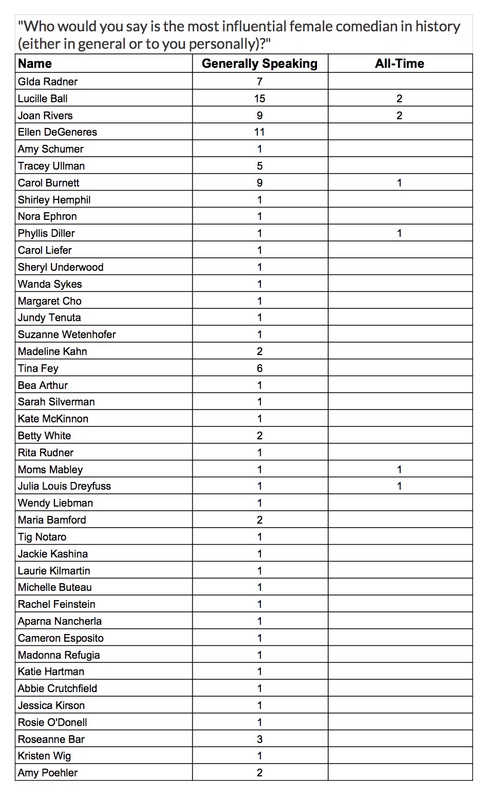 I should have reframed the question to be who was the most influential…or who are you most interesting in knowing more about…. 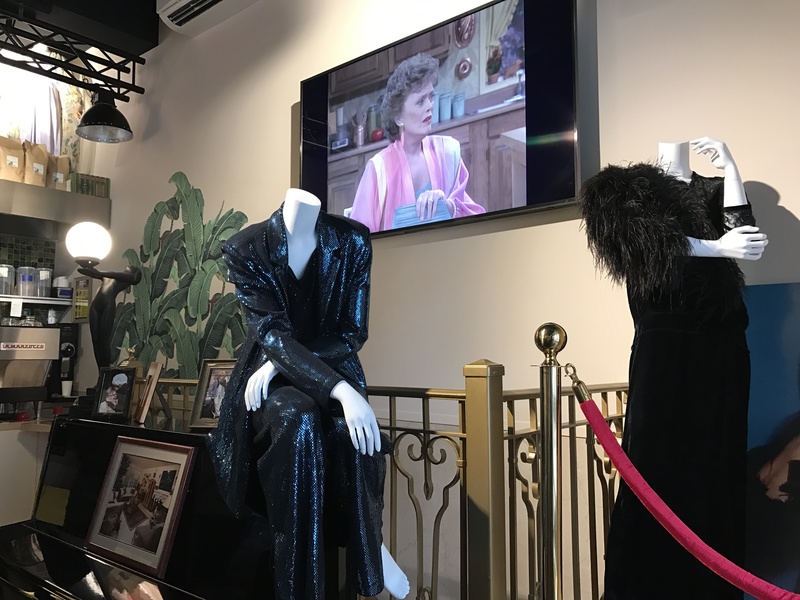 As it turns out, the Rue McClanahan and Golden Girls themed cafe, Rue La Rue Cafe had a soft opening this week. 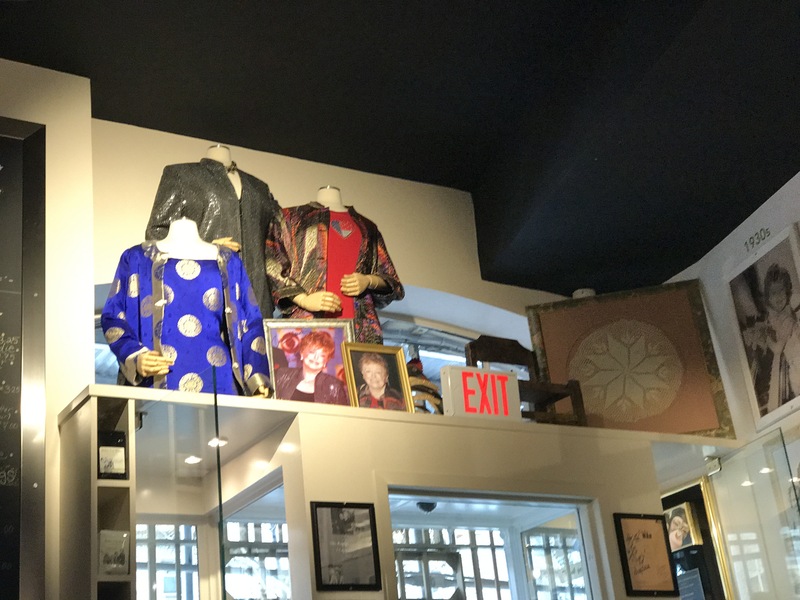 I had been in touch with the owner in the past and as a research trip I took a visit up to Inwood to see how this cafe-meets-exhibit was set up. Turns out it was wonderful. 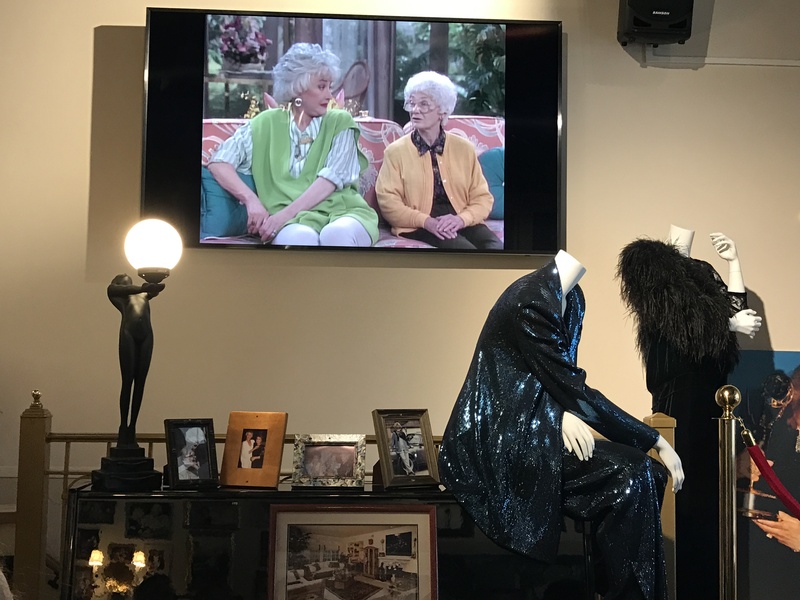 From recreated furniture from the show and original wall paper from the show on the walls, to photographs, artifacts and costumes of Rue, the cafe was a living archival homage to the ladies of the Golden Girls, specifically Rue. Right down to the yellow kitchen phone on the wall, to themed coffees and eggs made in Rue style. It is a themed paradise, and a great location for inspiration. I also took a trip to visit for inspiration to JUNK, a super thrift store in Brooklyn. I definitely found inspiration for other, new projects. Whether this means focusing on a specific period of time or just on one comedian or comedians, is yet to be seen. I want to create an entertaining, yet informative experience. I want people to leave this experience having learned something about women in comedy and I want them to feel the energy and power that is this history. I want them to experience and understand the struggle and uphill fight these women had to go through to make this journey. But I also want them to have a whimsical experience. I want them to be, above all else, entertained by the content. I want them to leave inspired and wanting to continue to keep the legacy alive and thriving. The scope is definitely narrowing in, but in all honestly, the research portion of this project is much bigger than the thesis timeline allows for – at least at its current scope. As it stands now, it is a project that requires reading, interviews, cultivation of artifacts and footage. The preliminary research takes time. However, the build is what I want to focus on, but I can’t get to it properly without clearing the research hurdle. This probably means that the scope is too big. The current concept feels too big for the timeline ahead. Each week although I feel like I am making progress, it feels like I am falling behind. Another huge department of concern of mine is not only procuring artifacts, digital content and footage, but also getting the legal rights to use any of the potentially gathered content in the project. Also, I would love to learn about how one gives credit to research sources, references and books in a museum style exhibition.